In a day and age when technology makes headlines for creating misinformation and distrust, it's refreshing to see a new marketplace that's designed to bring people together to solve challenges facing communities. And make no mistake — there is urgency for us to come together too, as nearly 11 million children in the United Sates live in extreme poverty. At the 2018 Dreamforce Conference Sept. 25-28 in San Francisco, United Way and Salesforce will share our vision for how we’ll work together to mobilize companies and their employees to find and engage in meaningful, effective ways to tackle the world's toughest challenges, including childhood hunger. Bringing people together to help them give back has been in United Way’s DNA for more than 130 years. 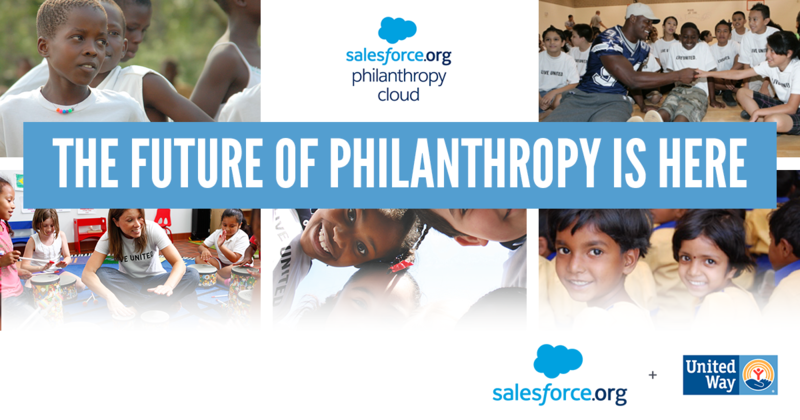 We partnered with Salesforce.org, the non-profit arm of Salesforce, to build a new marketplace, Salesforce.org Philanthropy Cloud, to help companies and employees translate passion into real change. For businesses, the system guides corporate social responsibility by driving employee engagement in communities, ensuring sound financial investment in high-yield impact funds and strategies, and amplifying positive community engagement with brands. For employees, Philanthropy Cloud uses artificial intelligence to connect people with relevant content and volunteer opportunities, while seamlessly investing in and championing causes. It’s the only global platform that connects employees, customers and partners with the causes they care most about. But Philanthropy Cloud is not simply a platform. At the foundation of the marketplace is United Way’s trusted expertise and local relationships in 1,800 communities around the globe. It is this bridge that can truly bring people together for the common good. Dreamforce, the world’s largest technology conference, drew more than 171,000 attendees in 2017. This year, United Way will host visitors at our booth in the “Campground," the main show floor at the Moscone Center, and United Way speakers will be featured during key segments throughout the conference. First up, Brian Gallagher, United Way President and Chief Executive Officer, will speak during the event's opening keynote. Watch the keynote live at 5:30 p.m. ET Tuesday, Sept. 26 at salesforce.com/live. Later in the week, he’ll take part in a fireside chat with Rob Acker, CEO of Salesforce.org. On Thursday, Sept. 27, Jerry Dannemiller, United Way's Vice President of Digital Services, will lead a session on ways in which United Way partners with businesses to impact communities.